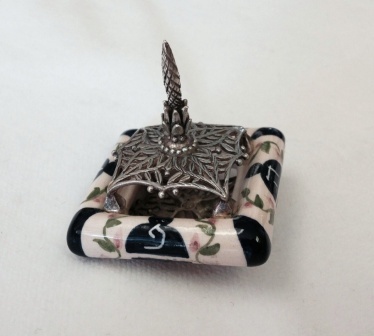 Handpainted ceramic dreidel by Israeli artist Danny Azoulay. Notice the Peh on the dreidel in the Israel style. Delicate 925 sterling silver stem and sterling silver filigree on top and bottom. Daniel Azoulay is a Jerusalem artist who combines traditional and modern media to create finely-crafted Judaica. Arriving in Israel as an infant from Morocco, Danny is a Bezalel graduate and Rosenthal prize winner who recently, returned to the art academy after twenty-five years, completing a Masters degree in Design. He lives in the village of Tzur Hadassah with his wife and four children.